President Trump was once again politically incorrect on Monday when he drew attention to the Democrat misbehavior at his State of the Union Address, perhaps pushing the boundaries of the definition of treason a bit in doing so. Virtually everything they do is treasonous so if he were to over classify in this one instance there are plenty of others, like their conspiracy with the corrupt Obama-Clinton-Soros Mafia and the Crooked Obama DOJ and FBI in the use of fabricated evidence in an attempt to overthrow his Presidency. That more than fits the definition of treason. President Trump was speaking in Ohio, promoting the new tax law and midterm GOP candidates when he took the sullen globalists to the woodshed. They are unhappy over their failure to prevent his successes and return America to Americans and it showed. Trump led off his comments by labeling Nancy Pelosi as “our secret weapon,” expressing his hopes that the Democrats leave her in power, and then using her brooding, partisan conduct and that of her Democrat comrades during his SOTU speech last Tuesday as a lead in to his criticism. Trump repeats points made in the speech, saying, “I said you have the lowest black unemployment in the history of our country.” He motions that they were stone-faced, saying, “They were told, don’t even make a facial movement. And I’m talking about, ‘You have the lowest Hispanic unemployment in the history of our country. '” Still for the most part they just sat there, unresponsive. 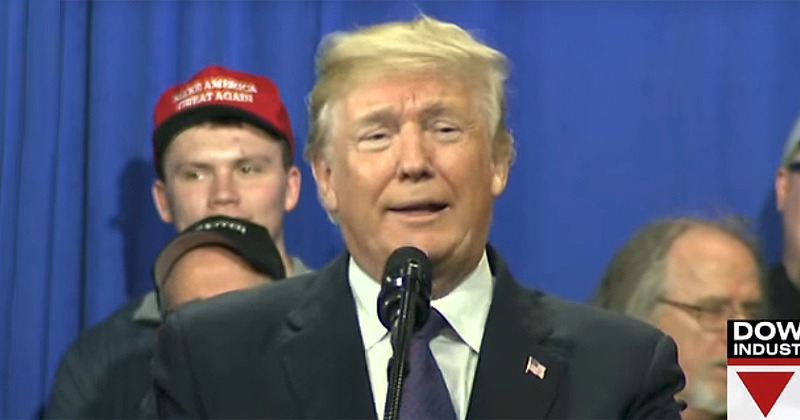 President Trump pointed ahead of him to the crowd, saying, “Somebody said treasonous, I mean, yeah, I guess, why not. Can we call that treason? Why not? I mean, they certainly didn’t seem to love our country very much. But you look at that and it’s really very, very sad. all the President did was POINT OUT THE OBVIOUS, HELL, THEY ARE ALL COMMUNIST AND TREASONOUS, AND THOSE OF US WHO PAY ATTENTION ALREADY KNOW THIS. it’s the INSANE BRAIN DEAD SNOWFLAKE FOOLS WHO DON’T. and BTY, my back surgery went well today and i even feel better. President Trump needs to keep pushing his plan for America; the hell with the demonRats.